A 28-year-old female presented with an incidentally detected mediastinal mass on routine chest X-ray.18 F-fluorodeoxyglucose-positron emission tomography/computed tomography (18 F-FDG-PET/CT) was advised to plan further course of management.18 F-FDG-PET/CT revealed a well-defined, lobulated, heterogeneously enhancing, FDG-avid soft-tissue mass lesion in the left posterior mediastinum in paravertebral location, extending into the spinal canal at the level of D1/D2 intervertebral foramen; however, fat planes with the spinal cord were preserved [Figure 1]. Overall, scan findings were suspicious for either a neurogenic tumor (most common posterior mediastinal mass) or primary lung cancer. No FDG-avid mediastinal lymph nodes were noted. Subsequently, excision of the mass was performed. Histopathological analysis of hematoxylin and eosin staining showed lymphoid tissue with effaced architecture of the lymph node with numerous lymphoid follicles, hyalinized atrophic germinal centers with prominent concentric rim of small lymphocytes (onion skinning in mantle zone), and eccentrically placed blood vessels [Figure 2]. 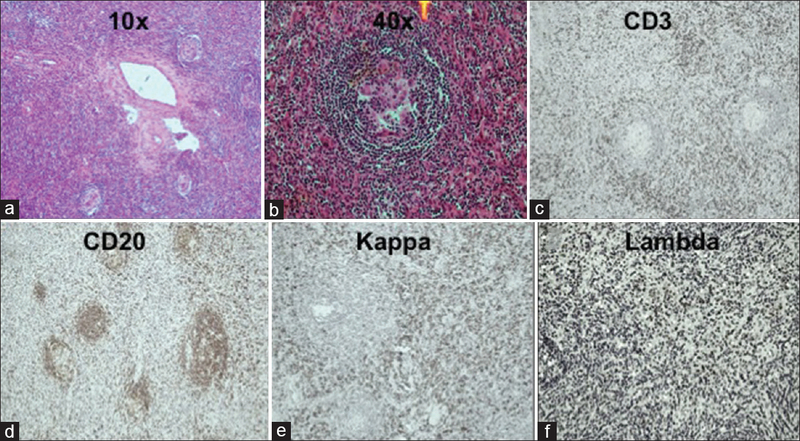 Immunohistochemistry confirmed the diagnosis of Castleman disease (CD). CD is a rare lymphoproliferative disorder with uncertain and poorly understood etiology. About 70% cases of CD are in the chest, although it can occur in other areas such as the pelvis, neck, retroperitoneum, and muscles. It is often misdiagnosed as lymphoma or primary solid malignancy when encountered at unusual sites. The two clinicoradiological subtypes of CD are unicentric and multicentric. The unicentric variant presents as well-circumscribed lesions, while the multicentric variant is frequently difficult to distinguish from a lymphoproliferative disorder.18 F-FDG-PET gives valuable information regarding the metabolic status of lymph nodes.18 F-FDG-PET helps in localization of disease in unicentric CD and in disease mapping and extent in cases of multicentric CD, which can later be used for response evaluation also. It has been documented that standardized uptake values of FDG-avid lymph nodes in CD are often less than that of active lymphomas. Unicentric CD is often curable with surgery; however, multicentric disease may require steroids, chemotherapy, antiviral medication, or the use of antiproliferative drugs. Follow-up is important to detect recurrence or conversion to lymphoma, as a small risk exists. CD should be considered in the differential diagnosis of well-defined mediastinal masses in asymptomatic patients with no known comorbidities. Castleman B, Towne VW. Case records of the Massachusetts general hospital: Case no 40231. N Engl J Med 1954;250:1001-5. Rena O, Casadio C, Maggi G. Castleman's disease: Unusual intrathoracic localization. Eur J Cardiothorac Surg 2001;19:519-21. Peterson BA, Frizzera G. Multicentric Castleman's disease. Semin Oncol 1993;20:636-47. Murphy SP, Nathan MA, Karwal MW. FDG-PET appearance of pelvic Castleman's disease. J Nucl Med 1997;38:1211-2. Dispenzieri A, Gertz MA. Treatment of Castleman's disease. Curr Treat Options Oncol 2005;6:255-66.